What I love about our back yard is that it’s beautiful because of our efforts to make it beautiful. When we moved in eleven summers ago (eleven summers ago! ), the yard behind the house was bare dirt. It was so bare, so dusty that my toddling crawling babies would be filthy after playing outside. One of our first projects was to build a fence to block off the view of the parking lot next door. Over the years we poured a concrete patio behind the house, supplemented with bricks, that the kids used to run their trikes on. The summer Fooey started walking, Albus and AppleApple and I used sidewalk chalk to colour each brick a different colour (while Fooey grinned and sucked on the chalk, according to photographic evidence). Grass grows here now, and weeds, and dandelions, and moss. Kevin’s dad, who died seven years ago this fall, planted some of the healthiest perennials — grasses and hostas — that thrive in hard growing areas of the yard. I think of him when I see them. We’ve lost a few trees and branches, some to storms and ice, and others by choice. I’ve got two long laundry lines strung between trees and the back porch. The raspberry canes we planted produce every summer, and we’re working on a rhubarb patch and blueberry bushes, and we bought our first cherry tree yesterday, with plans for a new row of fruit trees along the back fence. 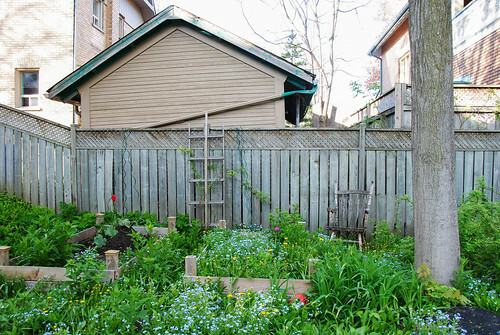 The back fence also has a ladder, new this summer, to assist smaller children taking a short cut. There’s the trampoline, the soccer net, the play structure, the sand, the painted stumps for jumping on. The raised beds continue to be a work in progress, in the back yard and the front. The picnic table is rickety and needs replacing (that’s on our summer to-do list too). We’ve never fixed the garage, which is as ugly and utilitarian as ever it was. When we moved in, we thought it would be among our first projects. Goes to show how priorities change. I’ve been sitting out here often these past few weeks, as the weather has gotten warm. The flowering garden is at its peak in spring-time. 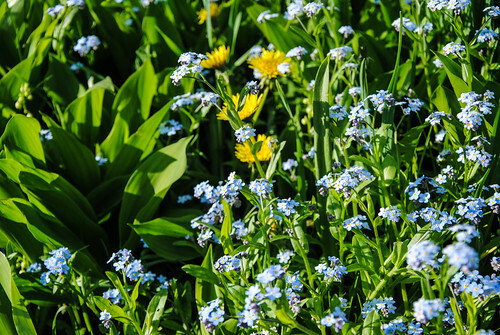 It is luscious and thick right now, variegated greens, colourful patches of purple and pale blue and yellow from the weedier plants that return each year, along with pinks and whites, yellows and oranges. Mint flourishes here too, and chives, which I see have already gone to seed. The dogs love to be outside, although they’ve got a dreadful habit of rolling in newly planted beds. I don’t think the new strawberry plants are going to survive. I’ve been sitting out here, soaking in the beauty. It’s strange how peaceful it feels here, despite the traffic rolling past non-stop on the busy streets that surround us. I hear wind in the branches. The colours are soothing. My heart slows down. The trees offer shelter, the sun warmth. I’m more blessed than I deserve. And so, to show my gratitude and to say thank you, I come outside, and I sit, here. I write. I watch. I listen. Think. Be.